A meal set at a table. A meal is a serving of food eaten by human beings. 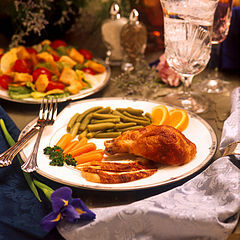 Meals usually include several different types of food, such as grains, vegetables, fruit, and in some cases, meat. Meals have different names by time they are taken or by the type of food that is eaten. In North America and in Europe, people usually eat three meals a day. The morning meal is called breakfast. It usually includes foods made from grain (cereal, porridge, or bread), fruit (apple, banana, or an orange), and milk products (milk, yogurt, or cottage cheese). Many people drink coffee or tea with their breakfast. Around noon, people eat their lunch. People who are working at jobs are given a break to eat their lunch. The lunch meal includes foods such as a sandwich, soup, vegetables, fruit, and milk. In some countries, such as Italy, people serve an alcoholic drink with lunch. In England, some people have a glass of beer with their lunch. In the evening, people eat their supper or dinner. Dinners are different in different countries. Usually dinners include a "main course" such as roast beef, a grain (such as rice or pasta), a vegetable (such as carrots or cauliflower) and a dessert (called a "sweet" or "pudding" in England). In some cases, a starter or appetizer is served before the dinner. Appetizers are a small serving of food such as olives, cheese, or bread. In many countries, people serve an alcoholic drink with dinner, such as wine or beer. This page was last changed on 6 April 2015, at 16:26.